Pepsi is one of several big-name stocks set to post earnings results over the next few trading days. Investors will see second-quarter earnings reports start to show up in the week ahead, and announcements from PepsiCo (NASDAQ:PEP), MSC Industrial Direct (NYSE:MSM), and Wells Fargo (NYSE:WFC) could send these stocks moving. Below, we'll take a look at a few trends to watch for in the earnings news. Most of Pepsi's snack, sports, and soft-drink empire has been performing well lately. Its food portfolio managed 3% higher volume in the fiscal first quarter, and international markets were standout performers, too. However, that good news has been overshadowed by weak growth in the core North American soda business. The segment posted reduced volumes and falling prices last quarter, while rival Coca-Cola fared better on both of those key metrics. Pepsi's CEO Indra Nooyi told investors in late April that the management team had a plan in place to turn things around in its U.S. carbonated beverage segment, which includes higher marketing spending to match Coca Cola's increased outlay. Investors will be looking for evidence that the shift has sped up organic volume growth without sacrificing too much in the way of profits. Overall, Pepsi's earnings on Tuesday are likely to keep its modest growth pace intact, with sales gains somewhere in the neighborhood of 2%. Metalworking, maintenance, and repair tool specialist MSC Industrial Direct posts its results on Wednesday. Its last report showed plenty of evidence of a continued cyclical rebound in its industry, with sales rising 9%, pricing improving, and operating margin expanding to 12.8% of sales from 12.3% a year earlier. Executives said in April that the manufacturing environment looked healthy, and those trends helped convince management to issue an aggressive outlook that calls for sales to rise by 11% this quarter, at the midpoint of guidance. In addition to those growth trends, investors will be watching gross profit margin for any signs that increasing raw material costs are eating into profitability. If MSC Industrial can't pass along those higher expenses to customers, it would imply softer operating results over the short term. 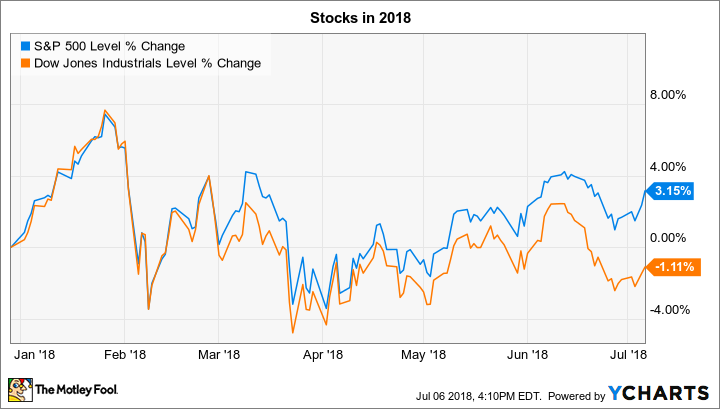 Wells Fargo shareholders have underperformed the market over the past five years, which stings given that big banks have enjoyed a solid rally lately. With economic growth accelerating, interest rates rising, and tax rates falling, there are many reasons to be bullish about these financial giants' businesses. Yet Wells Fargo's various scandals have contributed to worsening deposit and loan metrics, and so Wall Street has left the company out of the recent finance rally. On the other hand, that slump could set the stock up for a significant rebound, especially if new CEO Tim Sloan continues making steady progress at shoring up the bank's battered brand. In Friday's earnings report, investors will be watching for evidence of firming deposit and loan volumes, along with improvements in Wells Fargo's core financial metrics such as return on assets. The outlook for direct cash returns, meanwhile, should be bright: The Federal Reserve approved a modest dividend increase, and the company plans a massive stock buyback for the current fiscal year.